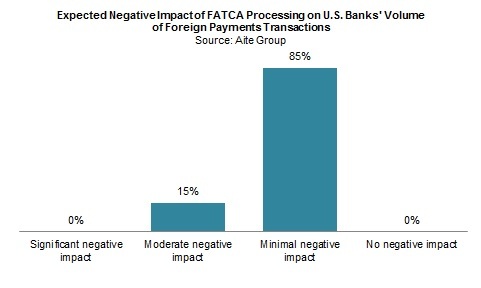 Despite organized and vocal opposition, FATCA will represent the new normal for U.S. taxpayers living abroad. Boston, July 23, 2015 – The Foreign Account Tax Compliance Act is a U.S. federal law requiring U.S. citizens to submit yearly reports about their non-U.S. financial accounts to the Financial Crimes Enforcement Network. It further requires all foreign financial institutions to identify U.S. accountholders and report their assets to the U.S. Treasury. FATCA targets potential tax evasion by U.S. taxpayers with foreign accounts, but it will have consequences for foreign financial institutions, U.S. financial institutions, and withholding agents as well as U.S. citizens living abroad. This research discusses the law’s requirements of various constituents and their experience of FATCA’s implementation. It was produced through extensive desk research and brief qualitative interviews with approximately 30 U.S. banks of various sizes. This 22-page Impact Note contains three figures and three tables. Clients of Aite Group’s Wholesale Banking & Payments service can download this report.